Ideal for warehouse, retail outlets, garages, public buildings, offices. Polycarbonate is an excellent choice for prisons, jails, industrial applications where breakage and vandalism is high. High quality mirrors with impact-resistant polycarbonate lenses. Mirrors are lightweight, fade-proof and virtually unbreakable with top-quality silvering and near-perfect convexing which affords the widest angle of vision. Lighter and brighter than glass. Each mirror individually packaged, complete with ball swivel and adjustable chrome-plated mounting brackets. 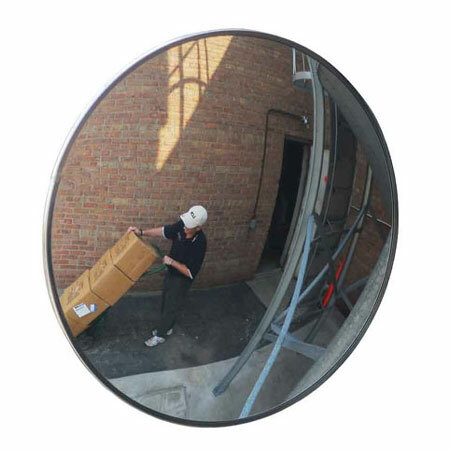 Convex Mirrors are a retail store's first line of defence against shoplifting and pilferage. Each increases aisle visibility and eliminates blind spots. Also excellent as safety mirrors in preventing industrial intersection accidents.